two peas & the dog: food. feta sandwich spread. Not sure how I came across this Food & Wine recipe but it looked easy enough for a lazy Saturday afternoon lunch (most likely on of the hundreds. The original recipe is for a whole sandwich, I'm focusing in on the spread for said sandwich. It looked too easy, which means the screw up factor could be pretty high for me. Fortunately, it turned out really well! I ended up making a second batch to have on hand for lunch this week. 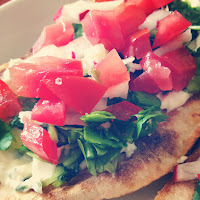 I used this spread on toasted pita bread, topped with watercress, radishes and tomatoes. You can also top with olive oil and some salt & pepper.